That's What She Fed: fojol bros. These days there are more foodtrucks in DC than you can shake a stick at. It is a little daunting trying to follow twitter feeds in the office and plan you lunch break around waiting in a line of an unknown length at a street corner somewhere in the city. 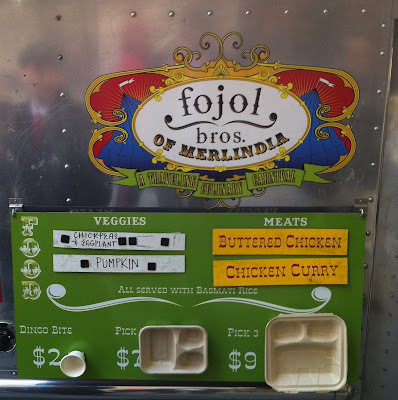 One truck that I find myself going back to is fojol bros. of merlindia because they serve up good, affordable and filling Indian food and they are regularly outside of my office building. Fojol bros. offers two meats, usually butter chicken (delicious) and chicken curry, with two vegetable options. I've been happy every time I have visited merlindia, but more importantly, their dishes pass the Indian coworker test.